Avatar Collector's Edition boasts eight hours of unseen content | What Hi-Fi? 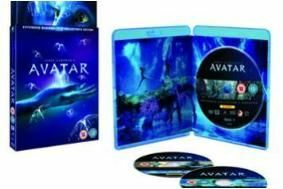 If you couldn't get enough of James Cameron's blue planet, then you'll be pleased to hear there's over eight hours of unseen material on the Avatar 3-disc special edition. On sale on November 15th, the Extended Collector's Edition will be available on Blu-ray and DVD and packs a formidable amount of content. Director James Cameron says he wanted "everything worth putting into a special edition" included and to make it "the ultimate box set", but then he would say that. Nevertheless, the 3-disc edition certainly packs plenty in, featuring the original theatrical release, a special edition re-release and a new collector's extended cut with an alternate opening scene. Also in the box is a feature-length documentary covering the "16-year filmmaker journey", which sounds something of an epic in its own right. The Blu-ray release will also take advantage of BD-Live, with additional bonus materials accessible online. If you really want to push the boat out there's a 'UK Fan Pack', limited to only 1000 copies and packaged in a numbered box and complete with a film cell signed by James Cameron. It's yours for £100. The Extended Collector's Edition: 3-Disc Collector's Edition Blu-ray – phew – will set you back £25, while the 3-disc DVD release will go on sale for £20. The boxsets are out on November 15th. Avatar, James Cameron's sci-fi epic, has broken the UK sales record for the first day release of a Blu-ray disc. The film sold 222,824 copies on Monday, racking up more sales in one day than the previous record holder The Dark Knight sold in its first week. On the same day, it was revealed that Avatar had become the fastest-selling DVD and Blu-ray release in North America, shifting a staggering 6.7 million copies in just four days. In January, Avatar became the highest-grossing film of all time, overtaking the $1.843bn (£1.19bn) taken by Cameron's 1997 film Titanic.